The famous cherry trees at the Brooklyn Botanic Garden have not been badly damaged by this spring's wild weather, experts at the garden said. Technically, it’s the first day of spring today. But those stubborn slush piles on every corner may have you wondering: When does spring really start? For us at DNAinfo, the season begins with cherry blossoms. 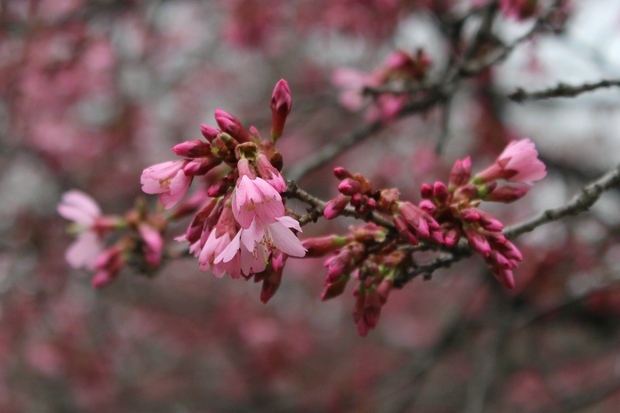 And, luckily for all New Yorkers, the wild weather of the last few weeks hasn’t damaged the beautiful blooms too much, the Brooklyn Botanic Garden says; in fact, an unusually warm February may bring the blossoms out early this year. The sleet/slush/snow storm last week damaged only a few early magnolia blossoms, peonies and a smattering of early-blooming cherry trees in the garden, BBG staff said in a blog post Friday. But the famous, spring-blooming cherry blossoms — Prunus ‘Okame’ and P. ‘Kanzan’ for you horticulture nerds — are doing just fine. Typically, the first cherry blossoms start coming out at the end of March and continue blooming through June, the BBG said, though peak bloom time is hard to predict. The garden’s annual cherry blossom extravaganza, the Sakura Matsuri festival, is scheduled to take place the last week of April. For now, despite last week’s cold spell, Funk is betting on an early showing from the cherries, thanks to that weird stretch of unusually warm days in February. “We’re still likely to see an early peak bloom, because they already got a head start,” he said. Can’t wait for that cheery burst of pink flowers? Check the BBG’s “CherryWatch” map for early blooms, updated every weekday.